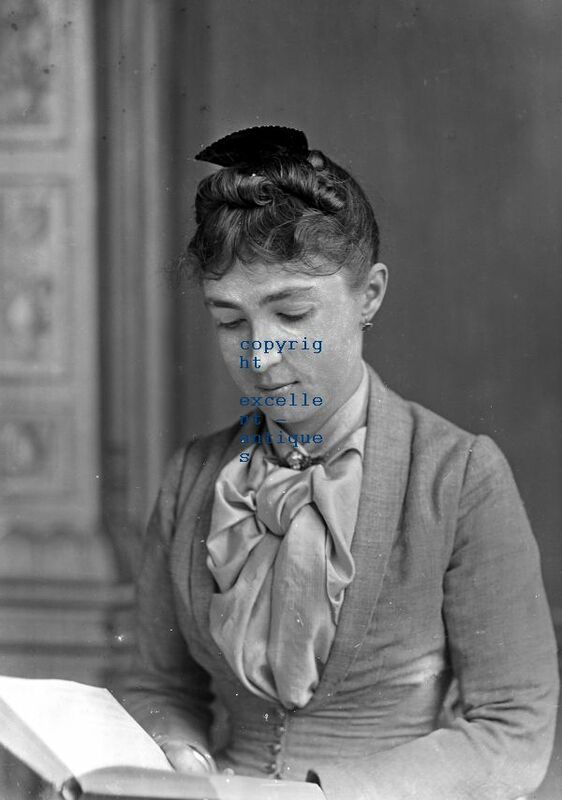 This item is a large glass negative (150 x 250 mm) - the image shown has been scanned and printed as a positive image. Prints can be made available if required - please enquire. Youngest child of Hermann, Baron de Stern and Julia Goldsmid. Married Sir David Lionel Salomons in 1882. They had five children: Maud , Sybil , David Reginald , Vera and Ethel. Daughter of one of the wealthiest men of Victorian Britain, Laura married David Lionel in 1882, becoming Lady Laura Salomons. They lived at the Broomhill estate in Kent and at 49 Grosvenor Street in London . Laura was involved with the running of the Salomons households, hosting many gatherings of scientists, photographers and transport enthusiasts at Broomhill and Grosvenor Street . She was a devoted mother to her five children. Although nothing has been found in the records, it is known that David Lionel was in favour of allowing women some freedoms - including driving motor cars. So perhaps Laura was one of the first women drivers? She outlived her husband and two of her children, dying in the same year as her daughter, Maud. She is buried in the family burial ground at Lower Green, Tunbridge Wells. Son of Philip Salomons and Emma Montefiore. Nephew of Sir David Salomons , from whom he inherited the title and the Broomhill estate in 1873. Married Laura de Stern in 1882. Five children: Maud , Sybil , David Reginald , Vera and Ethel. Educated privately, and then at University College , London , and Gonville and Caius College , Cambridge . David Lionel and his sisters were orphaned in their teens and moved to Broomhill to be cared for by their uncle, David Salomons . Sir David died just before David Lionel completed his studies at Cambridge , and he inherited the title and the estate. From an early age David Lionel Salomons was interested in science and mechanics and would pass his spare time in the workshops and factories of London . At the age of fourteen he befriended a watchmaker and learned how to repair and make his own clocks and watches. After he had finished his Natural Sciences degree at Cambridge he started a series of popular scientific lectures for the general public in Tunbridge Wells. These included demonstrations of electrical experiments, his chief enthusiasm. His second great love was transport - in all its forms. He invented a railway signalling system, built a magnificent stable block for his horses, acquired the second car in Britain and went on to be a pioneer of 'horseless vehicles', and in later years wrote a small book about aeroplane flight. David Lionel greatly extended the Broomhill estate, adding garages and a 'Science Theatre' at the back of the house. The house was one of the first to be lit with electricity, and it contained considerable collections of art and books.